Su Huan Er (Zhao Li Ying) got a bad feeling when Shi Wu Ji (Qi Ji) agreed to marry her. He, his two brothers and his sister loathe her father to the core. But if they thought they can torture her to settle bad blood, they are wrong. Shi Wu Hen (Han Dong) was only a stand-in groom at the wedding, yet he was attracted to the new bride's cheery disposition and unbeatable optimism. This created a problem because she was his brother's wife, not his. So when his brother's long lost betrothed fiancée, Liang Yu Shi (Zhou Fang), showed up at their doorstep, he stepped in to honour the families' agreement. What he thought was a marriage of obligation turned into a heart-breaking love affair in which he was willing to risk his family's lives to save hers. Shi Wu Jie (Guo Dong Dong) was the youngest and most passionate of the three brothers. When he met Qin Qiu Yu (Song Yi), it was love at first sight. His family, however, is strongly against their relationship because she was a courtesan. He decided to follow her to end of earth rather than to leave her. Shi Wu Xia (Zheng Qian) only had eyes for Leng Gang. She is not bothered that he was a servant's son. Yet, the difference in their social status was something he was unwilling and unable to cross. She get Su Huan Er to help change Leng Gang's (Ye Zu Xin) thinking. I have actually finished watching Cuo Dian Yuan Yang as soon as it was uploaded online, I should have do a recap of Cuo Dian Yuan Yang earlier, but never mind, better late then never. I was in fact quite skeptical on watching it as I find the setting a little ‘old’ initially; however I changed my mind after watching the first two episodes. It has a very wonderful storyline with terrific actors! This drama is divided into two parts, part one being Cuo Dian Yuan Yang and part two Xi Dian Yuan Yang. It took quite a while for the second part to air, therefore viewers have to wait after finish watching part one. Those who were watching concurrently at that time like me, will understand how it feels to wait anxiously for part two after part one ends. This drama consists of love stories of four couples, first two couples namely Shi Wu Ji/Su Huan Er and Shi Wu Xia/Leng Gang, is more focus in part one. While Shi Wu Heng/Liang Yu Shi and Shi Wu Jie/Qin Qiu Yu in part two. 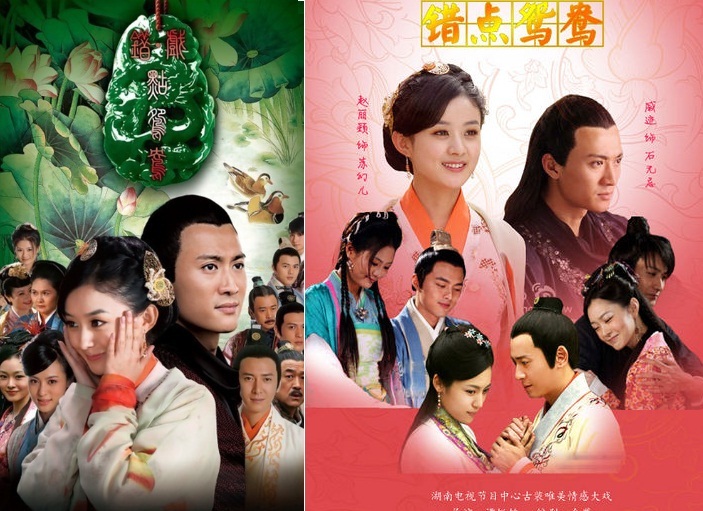 I liked the story of Shi Wu Ji and Su Huan Er best, although their great difference in height can be quite comical on screen at times (Qi Ji stands at 1.85m; Zhao Li Ying stands at 1.65m) but they were spontaneous in their performance. I like Zhao Li Ying from this drama; she is very cute and petite! I love the chemistry of this couple especially when Su Huan Er gets into trouble and Shi Wu Ji will always have to clear up the mess for her. Su Huan Er also looks cute when sitting on Shi Wu Ji’s lap while chatting; they do look like a real couple! Han Dong and Zhou Fang also make a delightful couple in this drama as Shi Wu Heng and Liang Yu Shi. Zhou Fang is so pretty and I think she looks quite suave as a male constable at the beginning of Xi Dian Yuan Yang! I also like the theme songs of Cuo Dian Yuan Yang and Xi Dian Yuan Yang, very nice. It is only in between watching Cuo Dian Yuan Yang and Xi Dian Yuan Yang that I realised this drama is based on an original novel wrote by a Taiwanese author, Xi Juan 席绢. I did not read the actual novels but did a quick search for the link to read out of curiosity, it was based on her two novels namely, Jiao Cuo Shi Guang De Ai Lian 交错时光的爱恋 and Xi Dian Yuan Yang 戏点鸳鸯. Even though I have never read her work before but I liked the story she wrote for Cuo Dian Yuan Yang and Xi Dian Yuan Yang, the process of watching the drama is enjoyable and most important, it is happy ending people! It is a joyful love story of four couples whom eventually had a blissful ending after going through ups and downs together. Wanted to watch Cuo Dian Yuan Yang but the link above is gone. Do you know where else I can watch. Thanks. I loved this drama! The first part was so cute! Shi Wu Ji and Huan Er! Haha I love how he's the silent, gruff type (as well as tall, dark, and handsome if he's smiling/laughing because of her) and she's so small and feisty! Are there any other historical period dramas with a love as romantic and strong as this one? I loved how he would reassure her that he loved her! Serious question haha. Any recommendations? Yes, the cute interaction between the two main leads were awesome! wish they were in more dramas together, Shi Wu Ji and Huan Er are so cute together. Where can i download the ending song...??? i love this drama at first i watch it on tv.....but ....is there any resource that i could watch this drama with eng sub? I was browsing online about Cuo/Xi Dian Yuan Yang when I encountered your blog. Both series are available in one channel with English subtitles as well as French, Romanian, and Spanish. Don't forget to leave a comment at the channel thanking my wonderful YuanYang Team who worked hard on this drama and brought into your homes or computer. ^^ @Seoul In Love, thank you for the good read and kind support to my channel. :) Hugs! AH, I HAVE ONE QUESTION, SO THE ONE WHO MARRY SHI WU JI IS Su Huan Er'S SERVANT, RIGHT? THEREFORE, THE Su Huan Er THAT LIVE WITH THE SHI FAMILY IS JUST THAT SERVANT'S ACT, RIGHT? (SORRY, I DONT REMEMBER THE SERVANT NAME) I'M JUST A LITTLE CONFUSED BY THIS, AND I'M TO CURIOUS SO THAT I HAVE TO ASK IMMEDIATELY. P.S 1: IS THERE ANY WAY THAT I CAN FOLLOW YOUR WONDERFUL BLOG BY EMAIL? I DON'T FIND ANY SUBSCRIBED BUTTON? Hi, thanks for viewing my blog & glad you like my post ~ no worries on your typing on caps, I'm fine reading it :) Hmm...ok see if I can recall...yup the one who marry Shi Wu Ji is Su Huan Er's servant/half sister, Yang Yi Liu. The real Su Huan Er fall off the cliff & because they look alike therefore Yang Yi Liu took Su Huan Er's place. The couple have a lot cute scenes/habits but I like the lap sitting best as its so affectionate & natural! I need them in .srt format! I love this drama! Love watching Shi Wu Ji and Huan Er. They are such a cute couple. Qi Ji and Zhao Li Ying are perfect for the roles of Shi Wu Ji and Su Huan Er. They got great chemistry. Would love to see them in more drama together. I like the drama but the Huan Er character started to get on my nerves in part two: too nosy and annoying. If you're a fan of Qi Ji, watch him on Cruel Romance. He acted really so well, his look a 'good' guy look, but is actually the 'bad' guy. They are a lovely couple in the dramas. Really hope to see more future collaboration. Zhao Li Ying is getting a lot of roles of late so I sincerely hope that Qi Ji would get famous soon...he got the looks n acting chops. He graduated from the Beijing Film Academy and his acting in Cruel Romance was good - able to portray the different aspects of the character. Visit Baidu for more of him and XLY. They certainly do! Ha Ha! If you had watched on youku the press conference of the drama sometime in Jan 2014, you would note 1) How XLY grabbed Qi Ji's arm to pull him beside her (the director was originally standing between them) 2) At the autograph signing just before they boarded a cruise ship, XLY told the interviewer that she was feeling cold. Qi Ji who was beside her very naturally reached over her shoulders and adjusted her shawl.